Printing and free machining onto Solufleece. 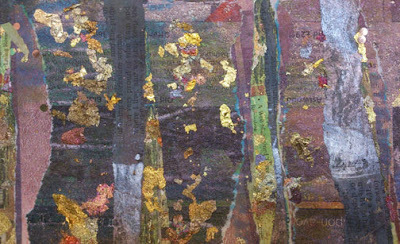 Printed and painted Bondaweb lifted off the backing paper, torn and ironed into place onto a canvas decorated with more painted Bondaweb an old newspapers. I have had a few days to play - a rare treat. 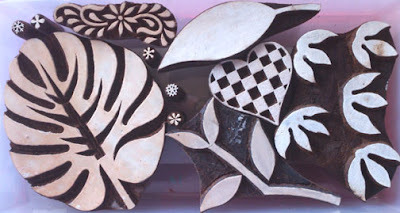 I have been making samples for the new show at Excel next week and for my upcoming workshop at West Dean College. Solufleece and the new self adhesive Solufix are very popular at the moment. I thought you might like to know about printing onto Solufleece. Teaching across the country as I do it is very apparent that many of you are not confident in your drawing skills. A way around this is to use printing blocks, your own or commercial designs. As Solufleece is water soluble you would think that printing onto it with (wet) paint would make it dissolve - not if you stretch it first. 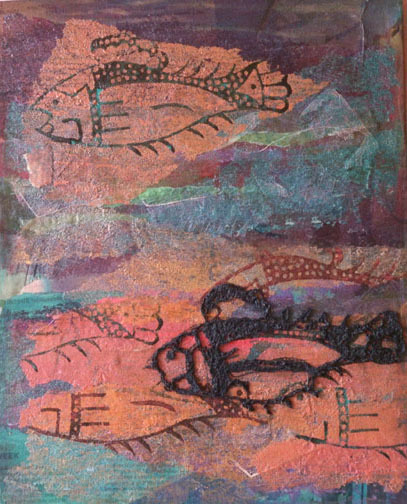 Those of you who have seen the Creative Bondaweb DVD or recent excerpts from it will have seen me printing onto Bondaweb then tearing and overlapping it onto a decorated canvas then ironing it in place. I was looking at the canvas yesterday and thought it needed a bit of definition. I use the following techniques in several of my newspaper based courses. Stretch your Solufleece in an embroidery ring making sure it is as tight as you can get it with out ripping the Solufleece. 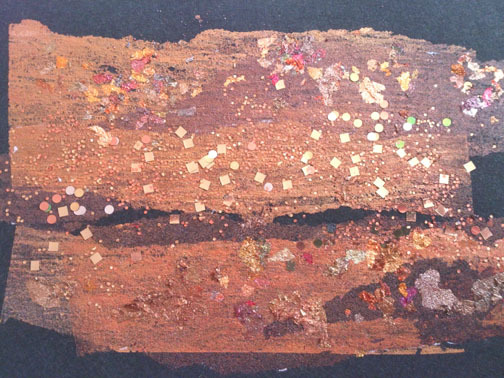 Using a sponge, apply a small amount of paint onto a sponge and dab the painted sponge onto your block. This way you get a controlled amount of paint to print with. Print the block onto your stretched Solufleece. You now have a design to free machine over. My well used fish block. 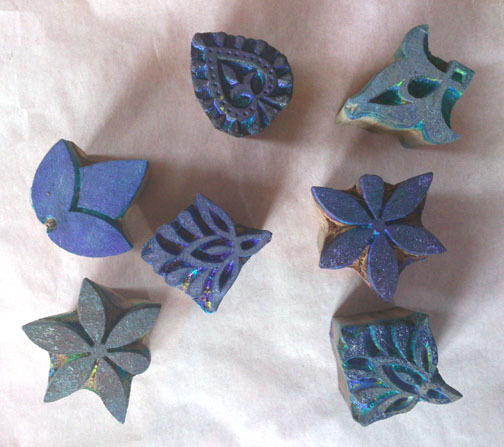 I clean my blocks with baby wipes as soon as I have finished printing. Try not to allow the paint to dry on your block. You will loose small ares of the design as they will get blocked with paint. 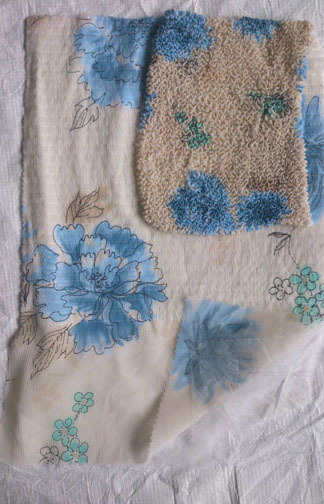 Of course, you can then end up with lots of printed baby wipes which you can then dry out, dye and then use for another project . . . it's never ending isn't it??? 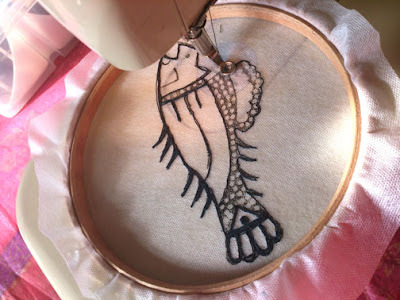 A tip my tutor gave me when I first learned to free machine at the tender age of eighteen (a lifetime ago), was to bring the bobbin thread up through your work before you start and hang onto both threads while you make the first couple of stitches, then you can cut the threads off. 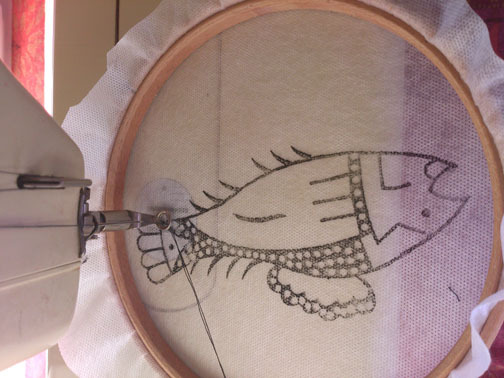 This gives you a good start and your machine is unlikely to stall or for the bobbin thread to get all caught up. 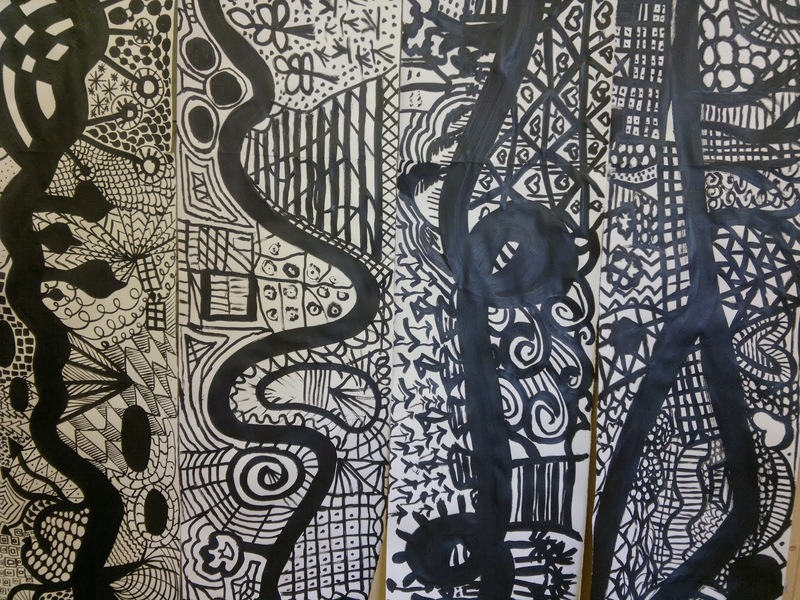 Free machine over and around your design, you can take a bit of artists licence and extend lines, leave lines out - it's up to you. Once your design is completely stitched and you made sure that all stitches link up you can dissolve the Solufleece from around your design. To do this trim all excess Solufleece and dip into a bowl of cold, warm or hot water. It works at any temperature. 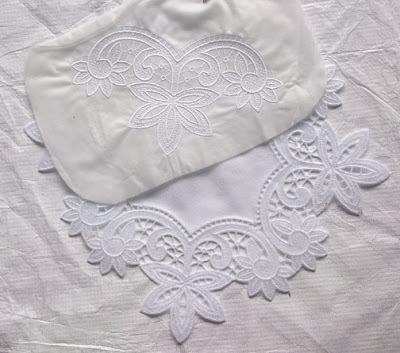 If you have a delicate design, you might like to pin it to an old polystyrene tile or similar so that your design holds it shape as you dissolve the Solufleece. 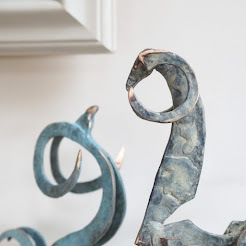 Lacy designs can get into a right muddle and it can be difficult to unravel them. If you are working on fabric or paper you can hand stitch your free machined design in place. 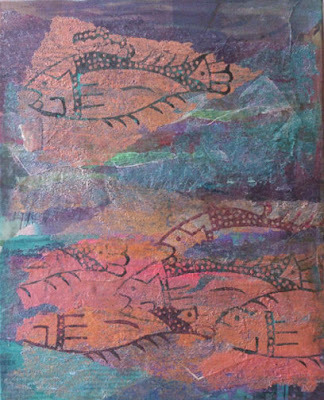 As my fish was to go onto an already decorated canvas I had to stick it on. I used texture gel for this. It makes a good glue and a great varnish as well. I hope this helps those of you who are wary of drawing free hand. We will using brightly coloured cans, sweet wrappers and Solufleece to make all manner exciting surfaces. I love the contrast of the metal with the free machine stitching - and of course it's shiny - I love shiny!!!! Cutting shapes with a hole punch. As always the spaces in between always fascinate me. They are great fun to stitch over. I have more samples to make but thought I would show you what I have done so far. nid-noi.com has gone bonkers this week, mainly with orders for Hot Spots! thanks to the article in Stitch magazine this month. Bondaweb is also selling well thanks to the Colouricious newsletter about me going out this week. I need to get all the orders out before I leave for Excel on Wednesday morning. If you haven't seen the excerpts from the Bondaweb DVD they are linked in the Coluricious newsletter at the end of this paragraph. Have a strong Vodka in hand and remember - I am built for radio. . . . . . Note to self - don't wear new contact lenses when filming - you spend the whole time blinking!!!! A fabulous show - part the second! 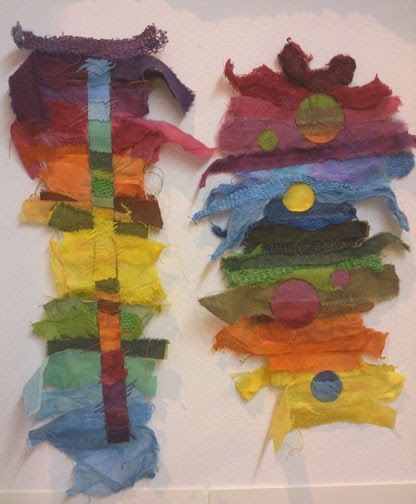 Two of Tracey's stitched colour samples. 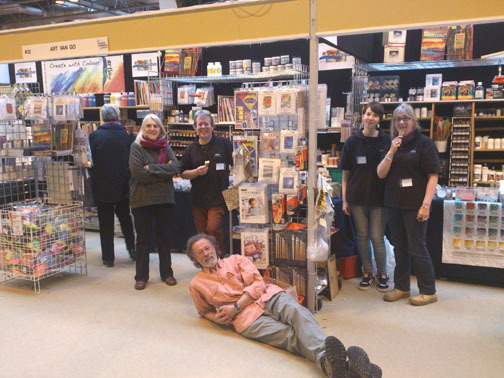 Well the show was less busy than previous years but that is hardly surprising considering we had so much snow. Many thanks to all of you who braved the weather, it was wonderful to see you. It was a bit of an emotional few days with the knowledge that I wouldn't being seeing 'my girls' for while. Their course has now finished and we are recruiting for the next course which starts at the end of May. I know I will see them again, just not so regularly. I know you are not supposed to get attached to your students - but you can't help it when you have been together for just under a year. 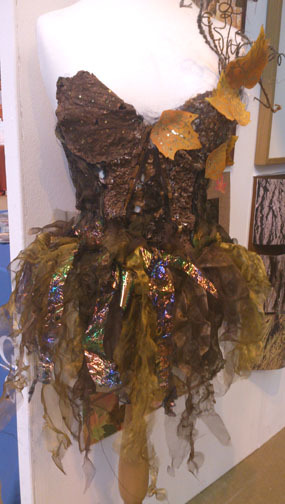 One of Tracey's experiments with the Classic Pelmet Vilene. 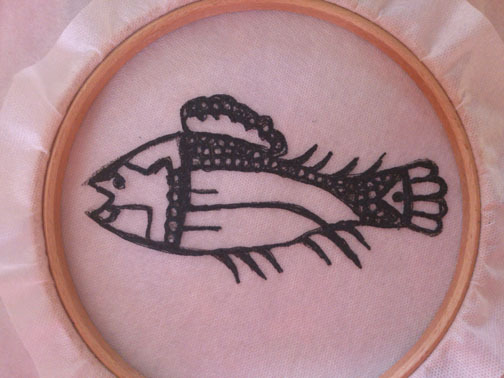 One of Shaun's stitched print samples. Heidi created a brilliant wall piece to illustrate her interest in D and T.
The piece had sections that moved and lit up. It is a very exciting piece. 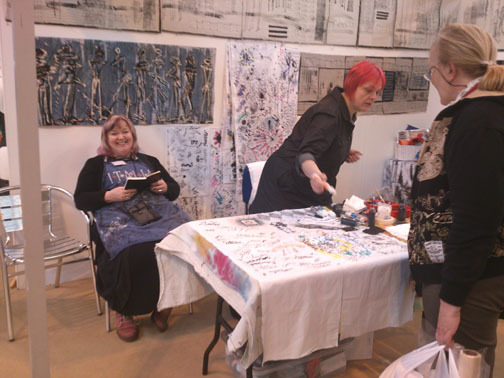 Sally created so much work she could have filled the ten metre stand by her self. It was difficult to choose what to hang. 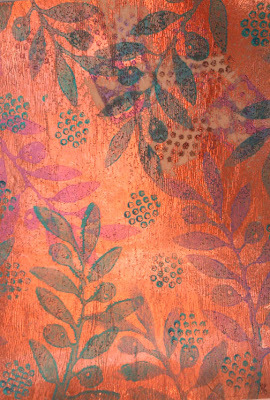 One of Sally's transfer print samples decorated with simple stitch. The girls dismantling their exhibition. The free workshops that I.C.H.F. shows offer are always popular. I am very grateful to all the tutors who delivered workshops for me in the Vilene Workshop. There will be something similar at Excel on the 4 -7 April - very soon - Gulp! Jo Leatherland and her workshop partner delivering their workshop showing visitors how to create applique shapes with Bondaweb and also how to foil it. Jayne Routley showed her classes how to needle felt into the Classic Pelmet Vilene to create a scene with a firm background. 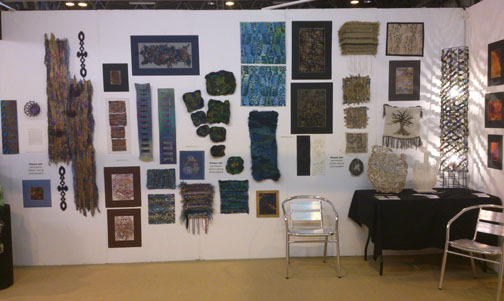 There were many fabulous textile artists, exhibitions and displays at the show, far too many to show on here. It is the biggest and most exciting show of my year. The divine Dionne Swift was there with her new work and was offering small workshops on her stand as well. . . and of course the best provider of all delights was there - Art Van Go. Bobby's husband Martin is reclining on the floor . 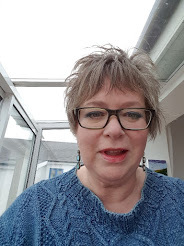 . .
Bobby runs workshops from her home in Shropshire and team teaches with Ruth Issett on their wonderful mark and colour workshops. 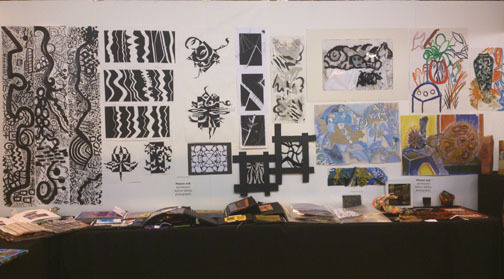 We are all used to seeing stunning work on the college stands but this year we also had a school from Wales exhibiting. I used to catch up with this talented pair when we did the show at Cardiff but as I.C.H.F. no longer hold a show there we have not seen them for a while. The Rumney High School stand. The work on the stand was by 15 - 16 year olds and was quite remarkable. A great testament to the hard work and dedication to these two outstanding teachers. 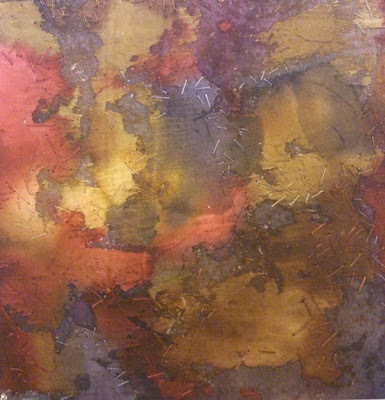 One of the beautiful, textured exhibits. I do hope we see these wonderful teachers again - and yes - I forgot your names - it's the medication I'm on. Sorry girls, I should have written them down!!! It was so good to see you again. so . . . . it's been a busy old week. 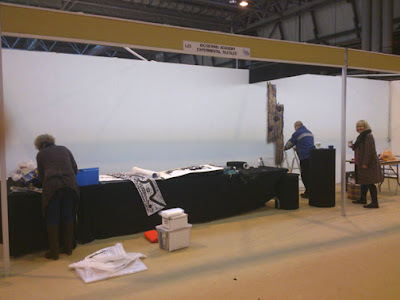 I now need to get up to date with orders for nid-noi.com and start to prepare for the new show at Excel. I love that exhibition centre, it's great being by the river. AND - my house is a tip, Jayne and I unloaded the van into it at great speed and now I can't move for STUFF!!! - no change there then!!! 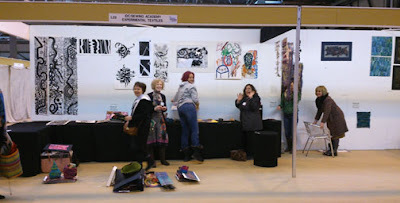 It was wonderful to see all my friends and customers . . and blog readers. Thank you all for taking the trouble to stop by for a chat. Hello Jill and the Welsh duo . . . .
Just in case you thought I was slacking . . . 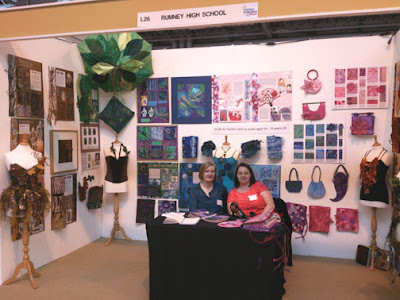 So - we have had a busy two days at Fashion, Embroidery and Stitch and.the weather doesn't seem to have put the visitors off, which is great. A huge effort goes into putting on this show and it would be a great shame if it wasn't seen by thousands. My Experimental Textiles students are showing their course work and some finished pieces alongside the catwalk. The ten metre stand is bursting with energy. I am so proud of my girls, they have done me proud. They have been taking it in turns to steward the stand and they are enjoying talking to the visitors and explaining what we get up to on the course. Beginning to sort the hanging order. . . .
A closer look at the design exercises the students use to take sections from to create printing blocks. Some of the finished work and more considered samples.
. . . and more. The work on display is a very small selection of what the students created on the course. It was very difficult choosing what to leave out. Shaun, Heidi and Claire chatting to a very interested visitor. 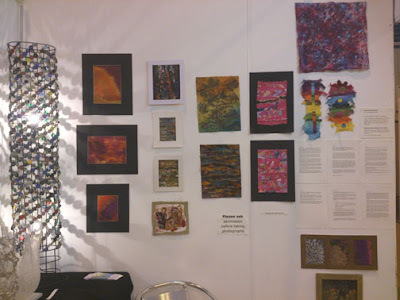 The Experimental Textiles exhibition is along side the end of my stand and it is great to be able look across and watch how the girls interact with the visitors. I feel like a very proud mother hen!!!! 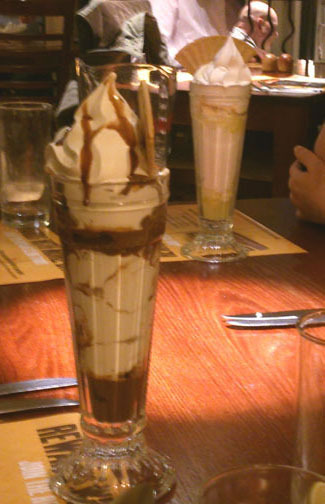 On Thursday night we all went out for a meal as it would be last time we would all be together. We had a FAB time, lots of laughter and making of plans. 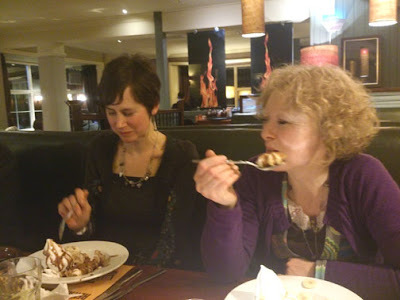 Apart from a very restrained Tracey - we all had puddings . . .
Shaun and Claire had waffles and fruit and 'Mr whippy' style ice cream. They didn't stop giggling all night. 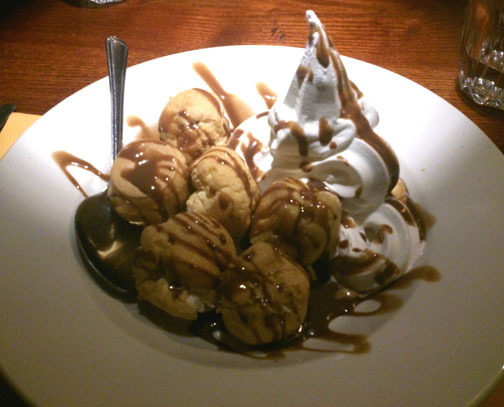 I had the profiteroles at the top of this blog. The friendships made on this course will last for a long time. The girls are going to continue meeting up and working together. 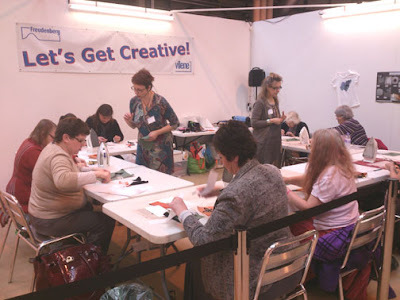 There are free workshops everyday in the Madiera and Vilene workshops. 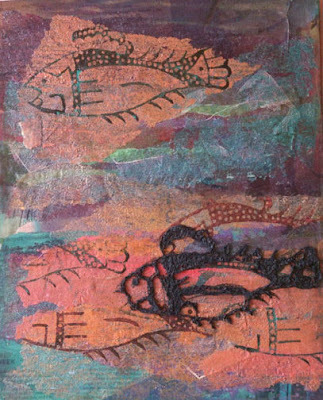 Linda Monk is one of the five tutors delivering a class in the Vilene Workshop. 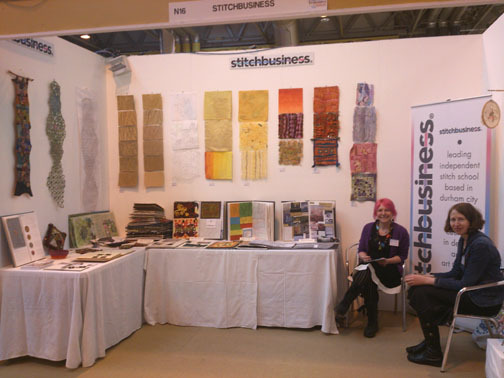 Julia Triston and Tracey a Franklin on the fabulous Stitchbusiness stand. I need to take many more photos to give you a 'feel' for the show. I will take some more tomorrow. It is difficult to get off the stand when it is so busy. There are so many interesting exhibitions and displays. 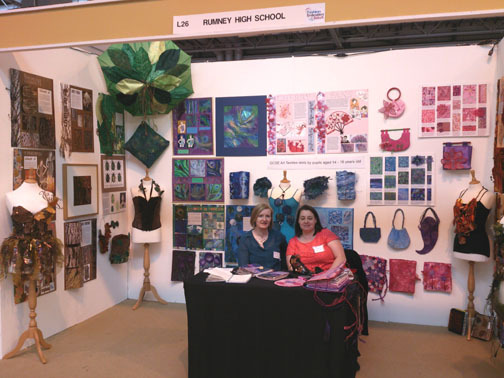 There are several college displays and I thoroughly enjoyed seeing Julia and Tracy from Stitchbusiness again. We keep in touch on Facebook but it is always good to catch up in person. 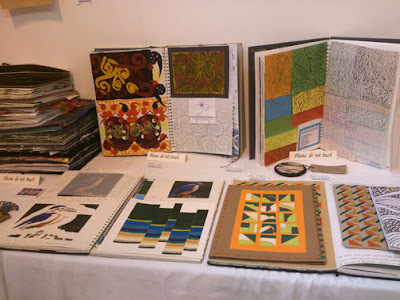 The Stitchbusiness students always create fabulous sketchbooks. Time for bed, it has been a very full on three days and hopefully we will have two more - we shall have to see what happens with the snow . . . . 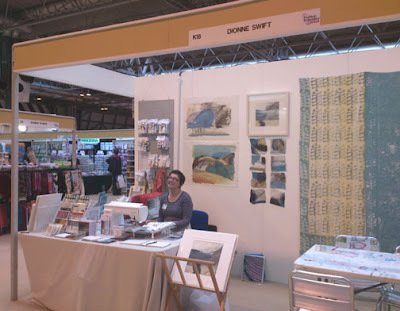 If you are coming to the show, do come over and say Hello, I'm on stand L22. See you Sunday Jill - Yeehaa!!! Chocolate wrappers free machine stitches with the help of Solufix and Solufleece. Oh how I suffer for my art!!! 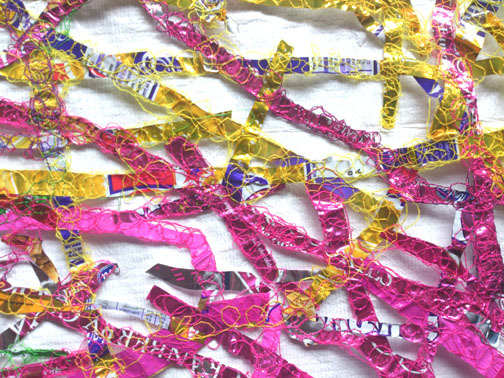 I love the bright, shiny colours of chocolate wrappers and enjoy using them as flashes of colour in my work. 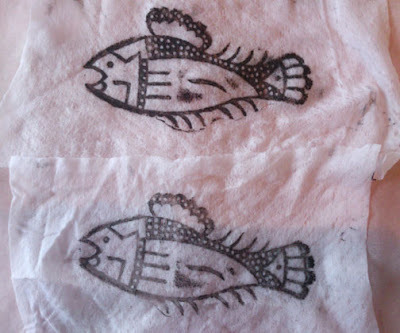 When ironed lightly between baking parchment they texture like Tyvek but remain soft enough to stitch into. They do ping about a bit if you try to free machine them but with the new Solufix I have no more trouble with them. Solufix is a self adhesive water soluble fabric on a strong backing paper that is removed to reveal the sticky side of the Solufix. Because the backing paper is so firm it means you can run it through an ink jet printer, print your design, remove the backing paper and then lay threads around your design and free machine to your hearts content. You may need to cover your threads with a layer of Solufleece if any of the glue is exposed. The glue will not affect your machine needle. 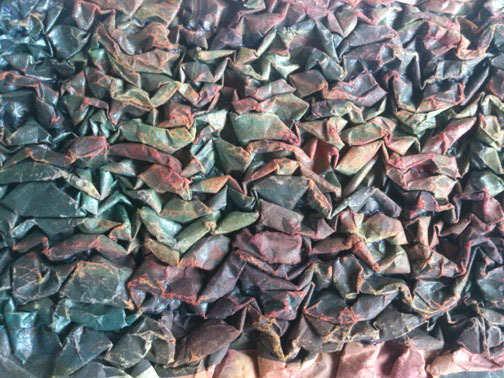 I stuck all my chocolate wrapper strips to the Solufix and then covered it all in a layer of Solufleece, machined away happily then washed away all the Solufix and Solufleece. FAB! 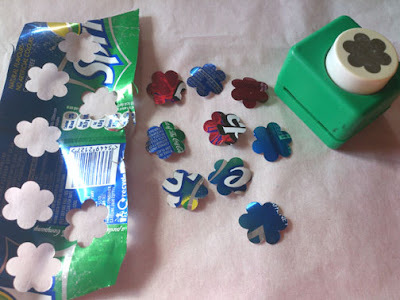 Sloufleece can also be used to 'Crash' or pucker up fabric. the top layer needs to be thinnish fabric. Natural or synthetic is fine. Stitch the layers together with tram lines, wavy lines, whatever you fancy. then steam with your steam iron without touching the top fabric and your layers will shrink to a third or quarter of the original size. This is - yep! newspaper crashed with Solufleece. You can of course do all the usual pretty stitchy things with Solufleece . . This beautiful doily was made for me by Thelma Judge who teaches all the proper dressmaking workshops at the shows. She is SOOOOO clever. I am spending today cutting several rolls of Solufleece in to metre lengths to put into bags ready for the show. I sell more Solufleece than anything else, both on my stand at shows and on www.nid-noi.com. 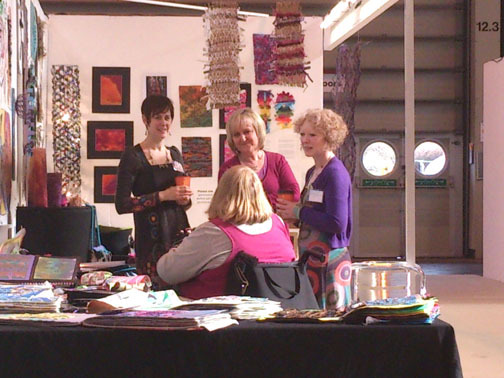 There are 3 shows in one - Fashion, Embroidery & Stitch, Sewing for Pleasure and Hobbycrafts. 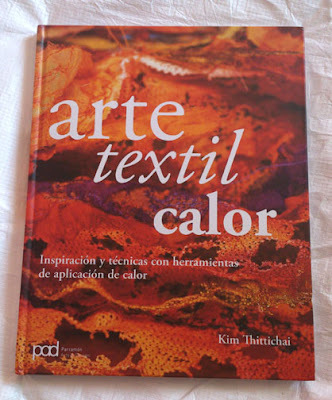 I will be part of Fashion, Embroidery and Stitch. This show goes from strength to strength. There will be many exhibits and displays as well as great tutors and college stands. 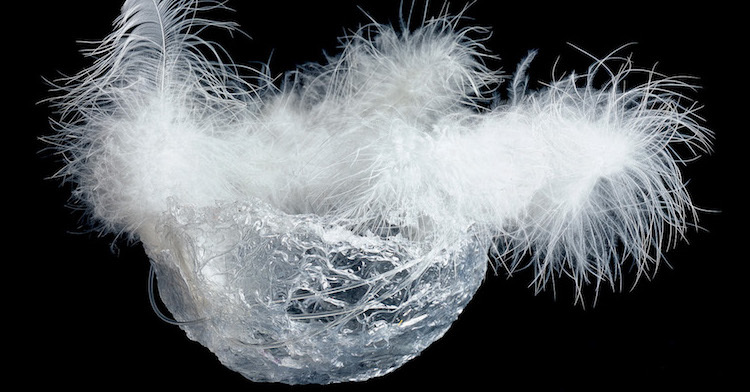 There is a particularly exciting exhibition from the Calais Lace Museum in France - something not to be missed. This show will also be special for me as my first group of students who have worked through my new Experimental Textiles course will showing their course work from the past year. 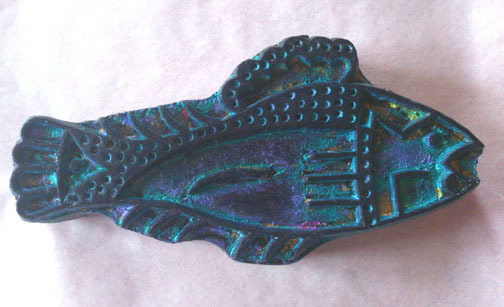 Decovil 1 was decorated with copper heat transfer foil and then printed onto. Great for bags and book covers. All workshops are free, are for 10 people only and it will be strictly first come first served for that day only - no one can pre book. All tickets will be given out on my stand - L22 (the far right corner as you enter the hall). Workshops will be limited to 2 per person per day. 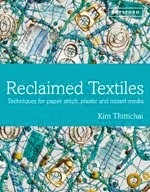 Kim Thittichai - Textured and Foiled Decovil 1. Learn how to decorate iron-on interfacing with transfer foil and then add texture by using texture plates in a die cutting machine. Paint can be added to add depth. Decovil 1 is fabulous weight of interfacing, suitable for bags, book covers and all manner of craft projects. 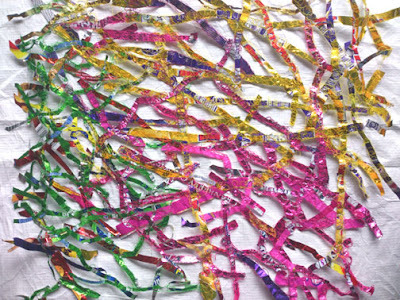 Heidi Ambrose-Brown – Transferring Colour and Pattern. Come and enjoy the colourful process of transfer printing. 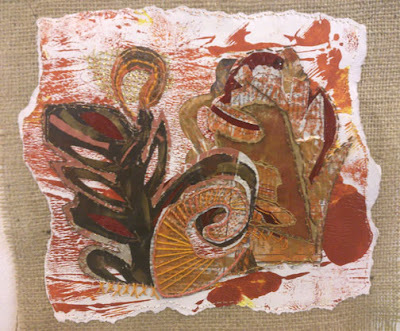 Using pre painted and dyed papers you will learn how to create resists adding interest to your prints. Using the classic craft/pelmet Vilene as a base you will create a brightly coloured, firm back ground on which to stitch at later date – or not. Jo Leatherland – Bond and Bling! 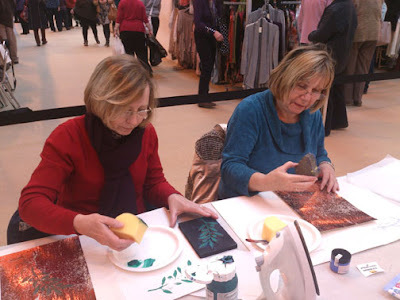 Have fun with Jo learning how to use Bondaweb for appliqué and for applying transfer foil. Both processes are washable and are so useful for many craft projects. 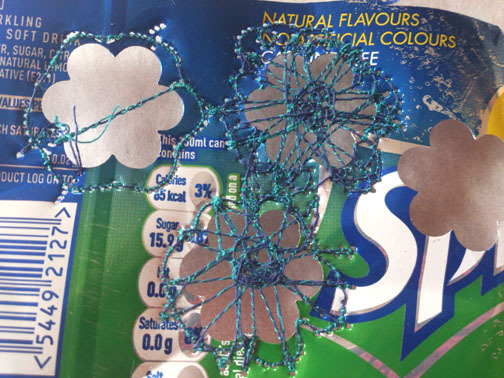 Artist Lynda Monk will show yuo how to create lacy fragments using Vilene Spunbond and Xpandaprint. Come and play with creating this surface using heat guns and irons and learn someof the many different ways you can take this technique further. Jayne Routley – Needle Felted Poppies. 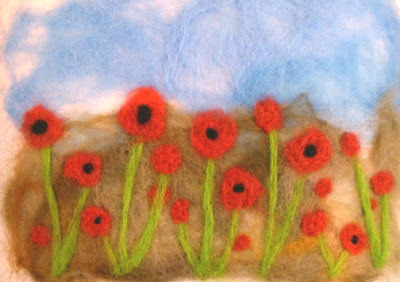 Explore the potential of needle felting into the classic craft/pelmet Vilene. This white sew-in interfacing is so versatile, Jayne will show you how to use it as a back ground to create your own needle felted picture. Do come and say Hello! if you come to the show - I may be dashing about but will hopefully have time for a quick chat. If I am not on the stand then Jayne will be - Jayne is my left and right hand at this show - I couldn't do it without her. Right! Back to cutting and packing. 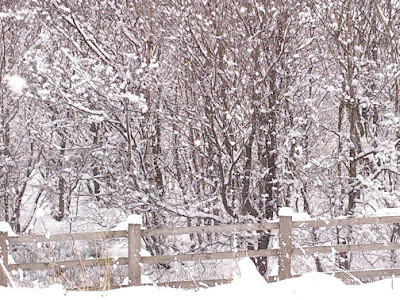 Snow, a translation and looking ahead . . . Hot Textiles has been translated into Spanish - Whoo hoo! The next, there was a whiteout. The traffic ground to a halt and we sat around for a while, an hour or so and then we started to move, slowly. With the ever useful travel information on the radio we were informed of an accident that had closed the motorway several miles ahead. We eventually diverted off the Southbound M74 via Lesmahagow, to return to a much faster moving M74. On the Northbound M74 there was a horrible accident involving two lorries and several cars. 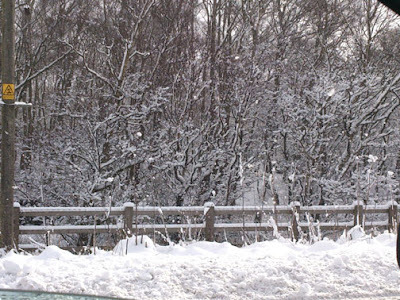 The scene certainly made me drive much more sensibly than usual. I delayed my journey home to Brighton as I heard on the travel news that the M23 was blocked with poor drivers stuck in the snow, most of them all night! Luckily my best friend Claudia lives in London and I rang her at 5.30pm to ask if I could stay. "Of course" she said, "I'm just making a chicken casserole, there is plenty for two". She is always so accommodating. A true friend. I eventually got home yesterday when all the snow had gone. 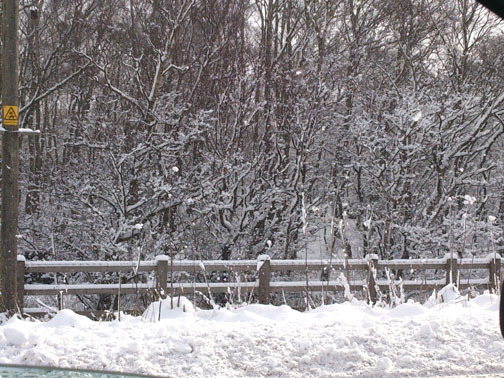 Until three years ago and living in Brighton on the south coast, I hadn't really experienced much snow of any depth. Being built for comfort and definitely not speed, skiing is not something I have ever considered. 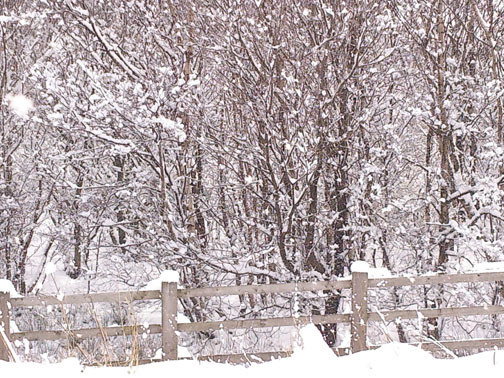 Three years ago we had a 10" snowfall in Brighton and every year since we have had at least 3". I managed to find some time to play, Yes! more newspaper. I am addicted - poor old girl! Here are a few of the samples I was mucking about with. 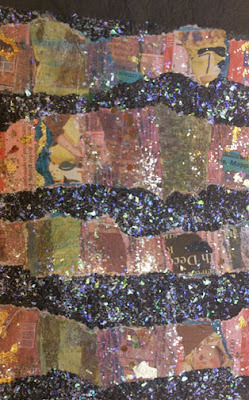 Painted Bondaweb was ironed onto black tissue paper which was then decorated with layered and torn strips of decorated newspaper. 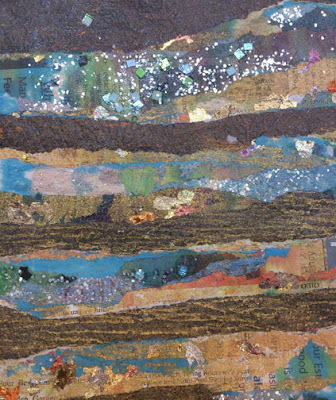 More decorated and torn newspaper strips with a judicious use of gilding flake. 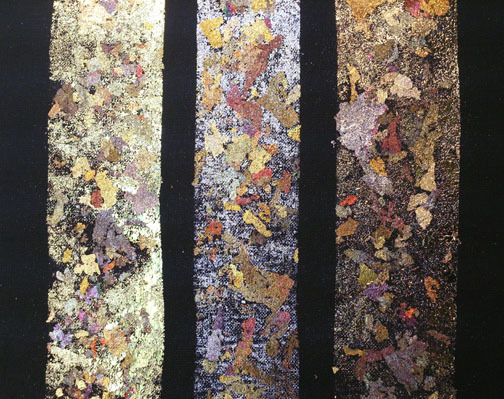 Strips of un painted Bondaweb ironed onto black cotton,decorated with a sprinkle of gilding flake - colour, Pirate Treasure. 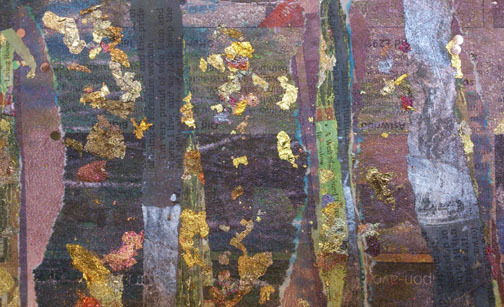 The spaces in between the gilding flake were filled in by applying silver and gold transfer foil. Painted Bondaweb again on black pelmet Vilene light. (I like this product as it is more charcoal than black, feels soft to touch and stitch and cuts well with a soldering iron.) I used gold and copper Blingy Bitz (the squares) and the same colours in Dot Jewels (round shapes). Gilding flake was added. I am now itching to hand stitch these samples. 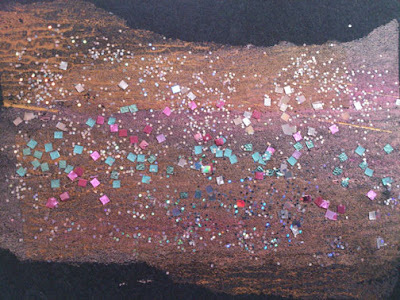 www.artvango.co.uk when you go into the shop it can be difficult to choose just a few sparkly things. 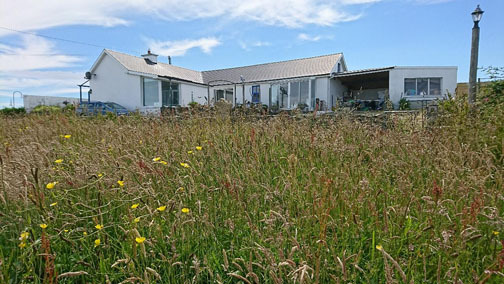 I love teaching there, Viv and Kevin are such wonderful hosts and it means I get to spend a bit more time with them. 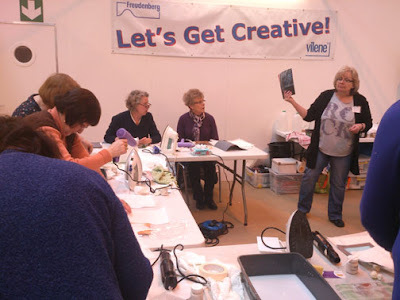 I think that's enough for now - I will post over the weekend with the details of the free Vilene workshops that will be a feature of the show next week.